Jewish Jesus - Art Exhibit: The Last Supper, Casting call for a Jewish " Jesus Christ (Media) Superstar "
The Last Supper, Casting call for a Jewish " Jesus Christ (Media) Superstar "
Jesus Christ Superstar is a rock opera with lyrics by Tim Rice and music by Andrew Lloyd Webber. The musical started as a rock opera concept recording before its first staging on Broadway in 1971. The musical is loosely based on the Gospels' accounts of the last week of Jesus' life, beginning with the preparation for the arrival of Jesus and his disciples in Jerusalem and ending with the crucifixion. It highlights political and interpersonal struggles between Judas Iscariot and Jesus, struggles that are not in the Bible. The resurrection is not included. It therefore largely follows the form of a traditionalpassion play. The work's depiction offers a free interpretation of the psychology of Jesus and the other characters. A large part of the plot focuses on the character of Judas, who is depicted as atragic figure dissatisfied with the direction in which Jesus steers his disciples. Contemporary attitudes and sensibilities as well as slang pervade the lyrics and ironic allusions to modern life are scattered throughout the depiction of political events. Stage and film productions accordingly feature many intentional anachronisms. 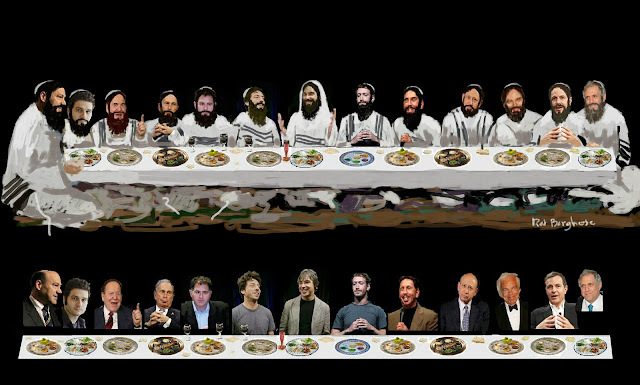 After Google posted its big numbers yesterday I realized that many of the media (new and old media) super stars are Jewish.... Larry Page, Sergey Brin, Mark Zuckerberg, Bob Iger, Shell Adelson, Leslie Moonvez..... so I decided I would assemble them all at a seder table and use them as Jewish models for a new version of the Iconic "Last Supper"
I would have used images of the many Jewish Nobel Prize Winners but nobody would recognize them. So I went with the current roster of Media Superstars. Amazing Talent and Genius ! Why is poor Lloyd Blankfein depicted as Judas Iscariot ? ... as the CEO of Goldman Sachs he represents the 40 pieces of silver traded in exchange for the Life of Jesus. Truly, the story could not have been accomplished if not for the essential role of Judas. I have no issues with Judas or Goldman Sachs, everything is required.